No awkwardness here! Though she split from Brody Jenner - and recently became engaged to Chad Kroeger - Avril Lavigne has invited Brody’s step-sis Kylie Jenner to return to the catwalk in her Abbey Dawn fashion show at New York Fashion Week next month. (It’s complicated, we know.) The teen model made a splash when she hit the runway (and brought lots of her siblings) during last year’s show. Lavigne confirmed the news to PEOPLE this week at the MAGIC fashion trade show in Las Vegas, where she was presenting the latest from her line. Admitting that she loves dressing her mom and sister - “I do their hair, too,” she shared - Lavigne said she most enjoys dressing up her guy friends. Chad, you’ve been warned! When it comes to Avril Lavigne‘s engagement ring, it’s not so complicated - it’s huge! Her new fiance, Nickelback singer/guitarist Chad Kroeger, 37, chose a stunning sparkler for his Aug. 8 proposal. So Avril's friend Caryn is the designer? Exclusive: Avril Lavigne and Nickelback Frontman Chad Kroeger Celebrate Engagement in Las Vegas! How does a newly engaged couple celebrate? By partying in Las Vegas, of course! Life & Style can reveal that Avril Lavigne, 27, and her fiance, Nickelback frontman Chad Kroeger, 37, wasted no time in toasting their happy news. "They went to 1 Oak Nightclub in Las Vegas on Aug. 21 to celebrate their engagement," an eyewitness tells Life & Style. "Avril arrived first with a bunch of male friends and bodyguards, then Chad showed up later and met them inside. Avril was so excited to see her man." "They were super cuddly and affectionate," the eyewitness adds. "They drank Dom Perignon and Grey Goose." After splitting with longtime beau Brody Jenner in January, Avril began secretly seeing Chad in February. Six months later, Chad reportedly popped the question with a 14-carat-diamond ring! This will be the second marriage for the songstress and the first for the rocker. Avril previously wed Sum 41's Deryck Whibley in 2006 and filed for divorce from him three years later. Chad dated former hair salon owner Marianne Gurick from 2002 to 2009. Though never married, they had a common-law partnership. AVRIL & CHAD (CHAVRIL?!) ENGAGEMENT PHOTO! Avril and Chad are on the cover of Hello! Canada magazine looking sooooo happy! Check out Avril's diamond SPARKLER! WOWZA! I can't remember seeing Avril so happy posing for a picture! BEAUTIFUL! The magazine is in stores Thursday. Click for a preview of inside the magazine showing Avril with a beautiful white dress! [EDIT] A preview of the People magazine article and closeup of the 14K ring. Avril is in Las Vegas attending the MAGIC Convention to show off the new upcoming Abbey Dawn convention. This took place yesterday afternoon, before the engagement announcement, so Avril is not wearing her ring. She looks so happy, doesn't she? 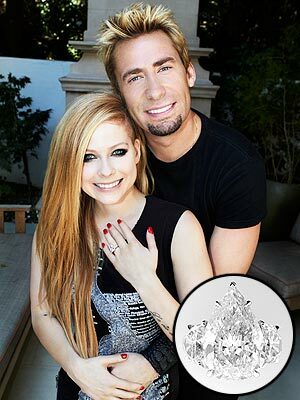 AVRIL AND CHAD KROEGER ARE ENGAGED TO BE MARRIED! WHOA! Now we know what Avril has been busy doing during her time off! If this news shocks you, you are not alone! I wouldn't have believed it if it wasn't tweeted officially. I am extremely happy for the two, but it's amazing how we never even knew that they were officially dating! They did a great job keeping their private lives, private! CONGRATS YOU TWO! Here is another new Abbey Dawn photo from the newest photo shoot. It seems to me that the pictures (in better quality) should be out any time now! Enjoy Avril's sexiness! I'm also liking the new logo! It's been a while since we have heard from Avril regarding updates for when the 5th album is to be released. As of a few months ago she said that the record is finished, but recently (as recent as today) we have confirmation from songwriter/producer David Hodges that she is still in the studio. Making us more b-sides perhaps? Or maybe we can expect a bigger record with 16 or so songs? Hopefully we hear more info soon! EDIT: Avril says the record is 100% done! From Twitter, Aug 19: "That's a wrap boyz @hodgesmusic and chad @Nickelback !!! Woo hoo. Super stoked for this record"
Bobsled, a communication app that allows users to easily message is teaming up with superstar Avril Lavigne to give six lucky winners the chance to connect with her personally. Five fans will receive a personal phone call from Avril and one lucky winner will walk away with an autographed Fender guitar! To enter, simply visit their Facebook page before August 10th and tell us how you'd like Avril to contact you (via phone, text, or email). Share the message with your friends and you're entered to win the autographed Fender guitar as well! With a universal way to communicate, Bobsled users can easily message or call for free across devices, countries, social networks, operating systems - and all mobile carriers. Make in-flight calls, leave voice messages on Facebook, and message your friends from your desktop with one simple app. Watch the video, download the app, and start connecting with friends all over the world! Avril was in Hollywood on Wednesday shopping at PopKiller Clothing, seemingly filming something with her friend Dipple. Now that Avril's back home from her vacations she has been posting some cute pictures on her Twitter. Yesterday, she posted one with her "bestie", marketing extraordinare Mike Heller, as well as 3 make-up free pictures posing with her makeup artist and friend, Gabriel. Doesn't Avril look gorgeous without all of that heavy black eyeliner? Less is more honey!